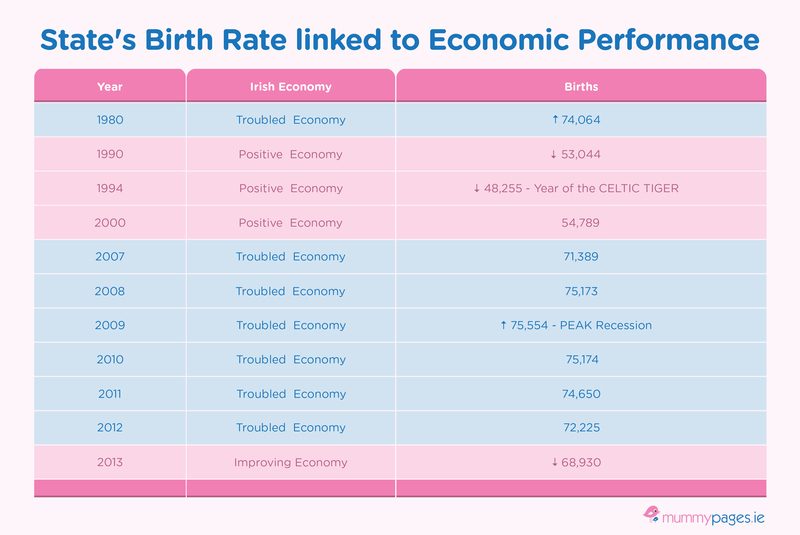 MummyPages.ie, Ireland’s largest community of mums has identified a significant link between the number of births in Republic of Ireland and the highs and lows of the economy. Analysis of figures obtained from the Central Statistics Office (CSO) reveals a recurring trend in the State’s fluctuating birth rate linked to the Republic’s economic performance, spanning the last four decades. 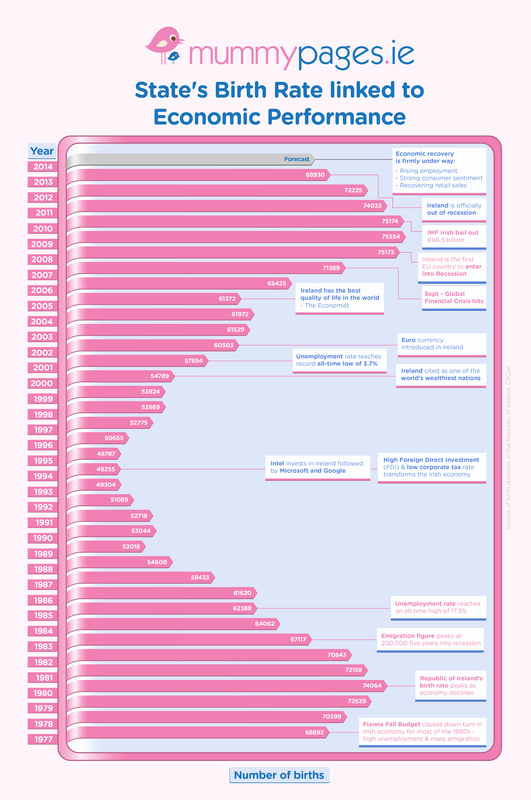 Today, the online parenting website, MummyPages.ie predicts the birth rate in the Republic to fall to the low levels recorded in the early nineties and noughties. Research by MummyPages.ie reveals how the State’s economy plays a key role in the Republic of Ireland’s changing birth rate. First seen in the 1980s, one of the bleakest periods in the State’s history with high taxation, high unemployment and mass emigration, the decline in the economy was linked to a rise in births. In fact, 1980 witnessed one of the highest birth rates ever recorded in the Republic of Ireland with 74,064 children born in that year. This is comparable only to the Republic’s next peak recession year which occurred more recently in 2009 and recorded 75,554 babies born. MummyPages.ie has observed that when the State’s economy experiences turbulence the birth rate increases and when it shows signs of recovery, the birth rate slows down. And now this trend looks like it is about to turn full circle again. This cycle starts again with the Celtic Tiger years in the mid 90’s when the lowest ever birth rate recorded this century was just 48,255. The start of the downturn in 2007 is then signified by a marked increase in births with 71,389 babies born, and continues to escalate throughout the recession to the highest figures recorded since 1891 with 75,554 births in 2009 – the peak of the recession. Last year, the CSO announced that the Republic of Ireland was officially out of recession. This news is also reflected in the slowing birth rate with history looking like it is now repeating itself as the birth rate falls in 2013 and broadly maintains this trajectory in the first quarter of 2014, in line with the improving economic outlook.